It’s summer time and it means sea, sun and fruits! Straight fruit is fantastic, but check out these creative recipes that take fruits like like watermelon, strawberries, blueberries and pineapples to a whole new level. Enjoy! An easy way to make summers cool.. 🙂 with these refreshing watermelon treats that are perfect for kids and adults alike! 1. 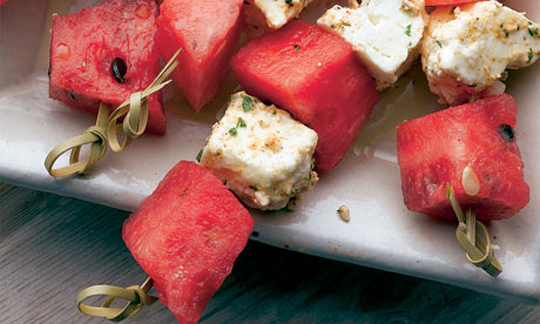 Watermelon and Goat Cheese Bite…..easy, fresh, and flavorful. The result is something like cinnamon…not watermelon and not basil. It is very interesting alchemy. It’s almost summer so these will become my new addiction…. So cute, easy and healthy dessert! Love this idea.